VMware has a free tool called ESXi Compatibility Checker which can check your hardware if it’s still supported by VMware. ESXi Compatibility Checker is a Free utility (a Fling) which has been released recently. We might see an integration directly to the vCenter server in future releases of vSphere. That would be nice. But for now, it’s an independent free tool or rather a script. The ESXi Compatibility Checker presents itself as a python script that can validate VMware hardware compatibility and upgrade issues of ESXi. To determine the compatibility of existing hardware is not a simple task. There are IO devices listed on VMware HCL, full servers and other devices, but it needs quite a work to gather all those information. It’s more convenient for the admin than to compare multiple web pages to the admin’s hardware, to execute a script which shows the results. ESXi Compatibility Checker provide a simple and easy way to collect server and IO device details from ESXi and provide a command line interface to validate their VMware compatibility and upgrade issues. Users no longer need to understand compatibility details or manually compare the dataset to find out compatibility or upgrade issues. 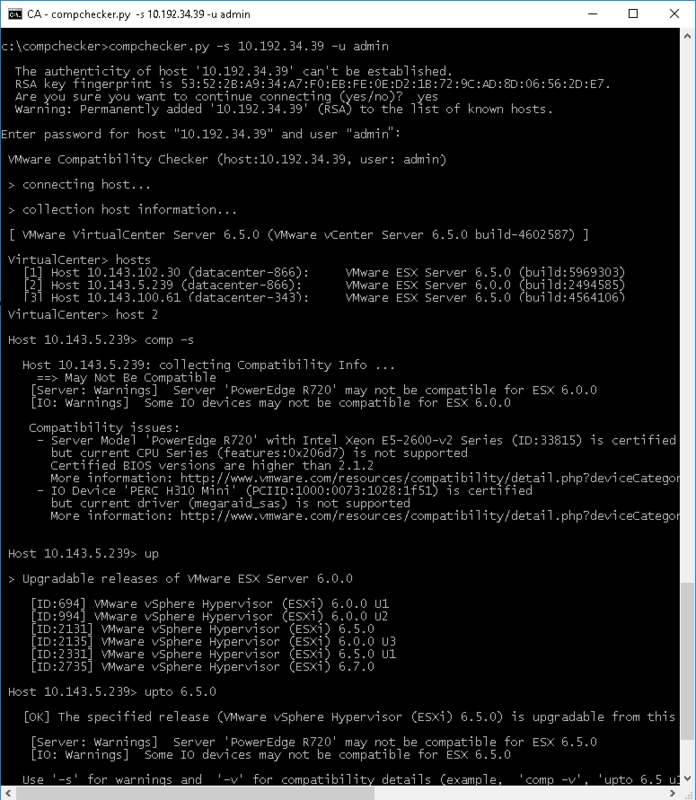 The Fling can generate a compatibility report for many ESXi managed by a VC with a simple command. The tool is freely available from VMware Flings website. You’ll need a python package too, and you can download it here. For now, you’ll need an internet access from the machine that you’ll want to run this script. Why? It’s because you must download the dependencies from the internet. But as I’ve seen a recent comment from ESXi Compatibility Checker page, the developer, Heejeong Shin is working on an “offline” version of this utility. So in my case I went to the Python website and downloaded the installer. Once done you’re ready to go. Check the full instructions and how to at this page. That’s all folks. Unfortunately, the tool did not work for me, as expected. Even with installing the dependencies (pyVim) I still received an error “No module named ‘pyVim’. Any thoughts? I was trying to run it from a Windows 10 machine. I’ll update this post when (and if ) I’ll succeed. VMware Fling site is an excellent resource for Free VMware tools. 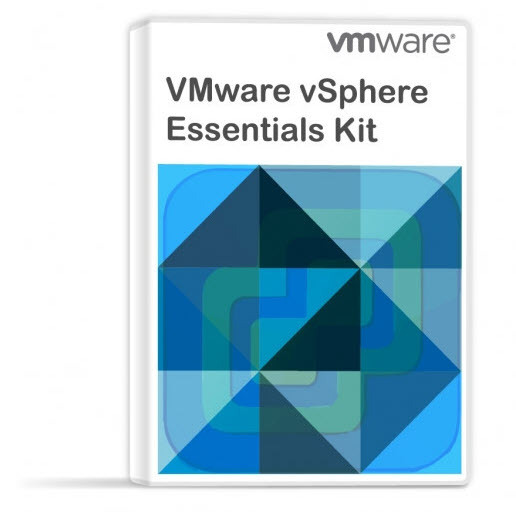 Some of them make it to the next release of VMware vSphere, for everyone’s benefit. 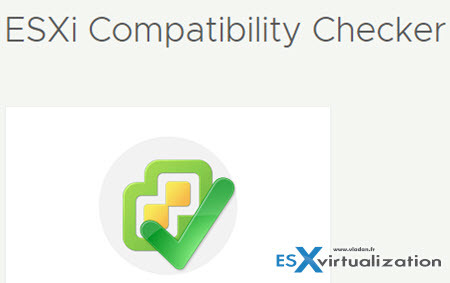 There is a free tool at VMware Labs called ESXi Compatibility Checker. It is a Python script which check your ESXi for eventual upgrade problems or if your ESXi is still compatible. No, connected without proxy. Actualy I did install those dependencies. But the error is still there… Strange. You are using pip version 10.0.0, however version 10.0.1 is available. This Windows 10 python solution of the problem, Python installation setup automatic installation, Python setup first screen select to Customize Installation and second screen select all options and install python. Successfully Python install and first pip module installation command run this users default folder. First command add this post, Python setup third page (Advance Options) pages select to Add Python to environment veriables select and install Python. I am getting same error message. No module named ‘pyVim’. I tried everything suggested here and nothing seems to work.